How were shillelaghs made? And a new database of antique Irish sticks. 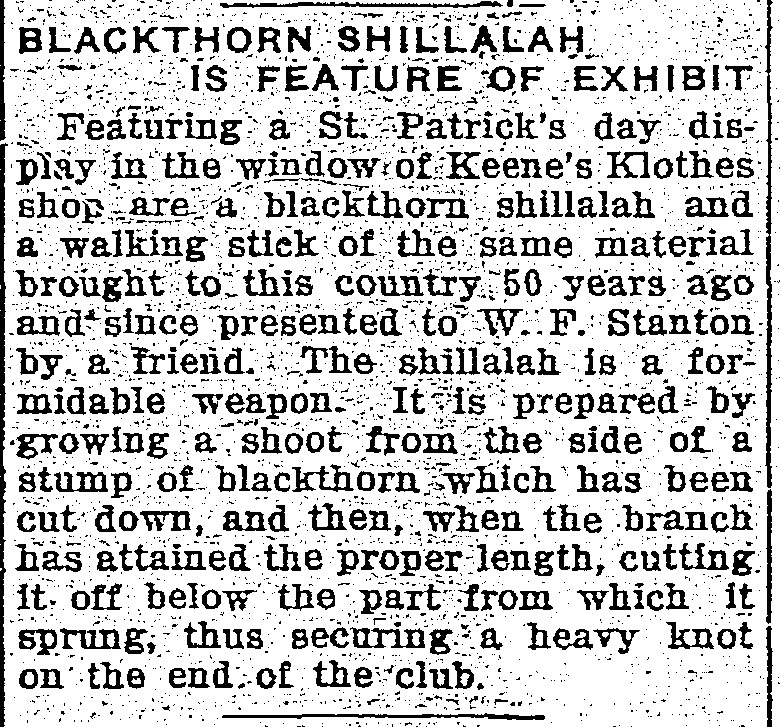 A lot of shillelagh in collections today were made around the late 19th to early 20th century to satisfy the demand of tourists. 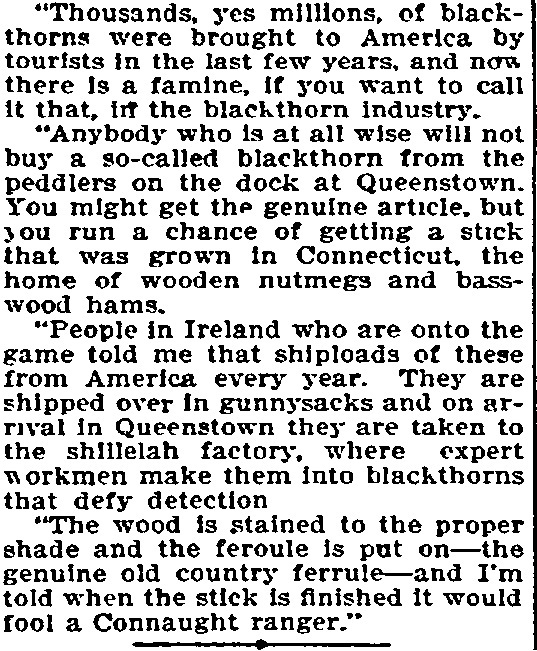 So big was the demand for the famed blackthorns that the slow growing trees were getting rare and that dealers had to import sticks from America… to sell to American tourists! Various ways could be employed at making the perfect sticks. But the most impressive description comes from William Wright’s “The Brontës in Ireland” published in 1893. Wright describes the process by which Hugh Brontë makes a shilellagh fighting stick which is quite unique and advanced. hour of conflict it carried him to victory. though, like the poet, it is developed and polished. growth of the main stem is skilfully cut off. which in an emergency can be used as a club. last visit to the Bronte Glen. became glossy black with a mahogany tint. Hugh Bronte cherished and loved his shillelagh." The reader might be surprised by this peculiar method of “pickling” the stick. After all is salt water not damageable to wood? Not by this method. I showed this to a Phd in wood chemistry who was quite impressed by how advanced this process was for the time. Indeed the salt from the brine solution penetrates the wood and acts in the same way as chemicals would in modern treated lumber, the crystals filling every pore and making the wood impervious to rot while giving it a certain added strength. The oil – the train oil being another name for whale oil – would simply seal everything. Secondly by putting the knob in warm ashes, the wood fibers would essentially become carbon fibers: so very hard but potentially brittle. This stick is now essentially dual hardened, much like a sword. The shaft remains softer as it is meant to parry, while the top of the walking stick meant to strike is now hardened to deal more damage. The magpie blood comes as the end of course to give a cosmetic appeal, the blood being a common wood stain at the time.